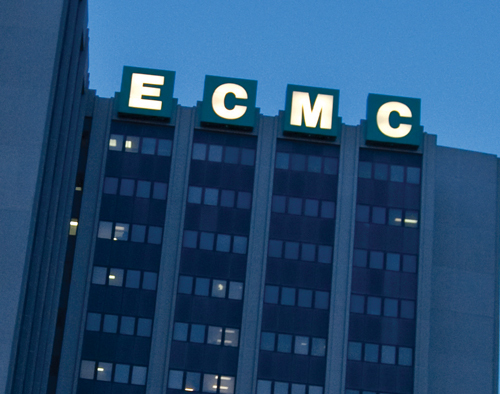 The ECMC health campus, located on the East Side of Buffalo and convenient to all areas of the region, includes 573 inpatient beds to serve our community, as well as outpatient specialty care and Terrace View, a 390-bed long-term care facility. 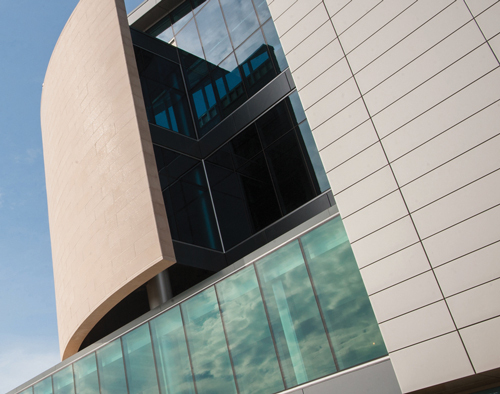 ECMC is the regional center for trauma, burn care, behavioral health services, transplantation, and rehabilitation and is a major teaching facility for the University at Buffalo. In addition to serving the health needs of our patients, we also offer amentities to make a stay more comfortable in both body and spirit. Pardon our progress! As of 6:00 am on Tuesday, November 13, 2018, the main entrance to ECMC will shift a few hundred feet to a temporary entrance to facilitate the construction of the new Russell J. Salvatore Atrium. 1 p.m.–2:30 p.m. | 6 p.m.–8 p.m.
Monday: 1 p.m.–1:45 p.m. | 5:30 p.m.–7 p.m.
Tuesday–Friday: 1 p.m.–1:45 p.m. | 5:30 p.m.–7:30 p.m. Weekends: 11 a.m.–1 p.m. | 5:30 p.m.–7:30 p.m.
Daily: 12 noon–2 p.m. | 5 p.m.–6 p.m. | 8 p.m.–9 p.m.
Daily: 11 a.m.–2 p.m. | 4 p.m.–7 p.m.
Bring your parking ticket with you into the building to pay at one of the parking fee machines inside the lobby before exiting the parking lot. Zak’s snacks—which takes CASH only, but offers a variety of snacks, stamps, newspapers and more. The ECMC Main Building also houses the METCARE RX Pharmacy and a Chapel. View the PHARMACY and PASTORAL CARE sections below for more info. 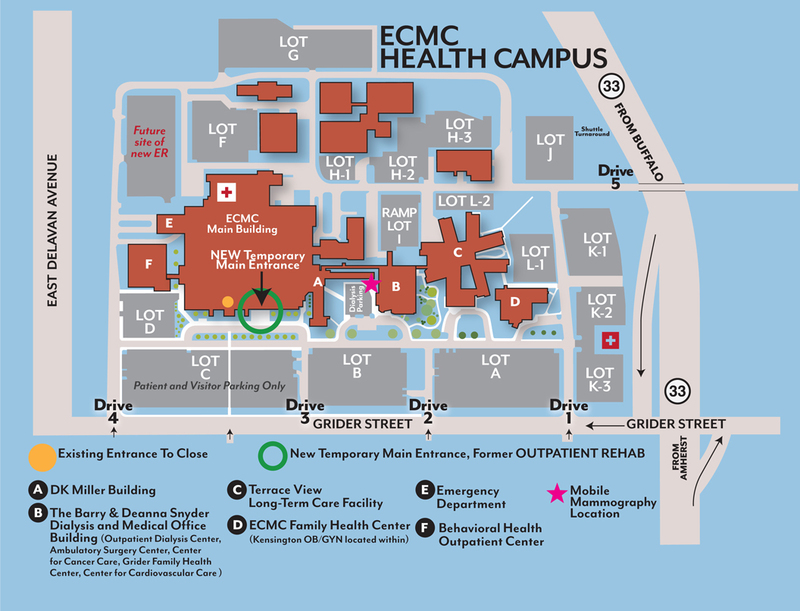 Patients and visitors to the David K. Miller Building have convenient access to the amenities of the ECMC Main Building. Visitor passes must be obtained at the Information Desk in the front of the main lobby on the ground floor. Visitation in most areas of the hospital is limited to two people per patient. For convenience and ease of access for ECMC Outpatient Dialysis Center patients, six (6) parking spaces have been designated and specifically marked in the DKM Circle (between the David K. Miller and Barry & Deanna Snyder Dialysis and Medical Office Building buildings) on the ECMC Health Campus. To park in these designated spaces, a special tag is required to be hung from dialysis patients’ rear view mirrors. The parking tags have been sent by certified mail to dialysis patients. To allow patients sufficient time to adjust to the assignment of these parking spots, a notification time frame will be allowed: For patients who are parked in the assigned spaces without the necessary tag hung from their rear view mirrors, ECMC Police will issue parking warning tags through July 4, 2016. Beginning July 5, 2016, parking tickets will be issued to those individuals who park in these designated spaces without the required tag attached to their rear-view mirrors. Thank you for following these parking guidelines to enable outpatient dialysis patients to have easy access to the care they require on a regular basis. 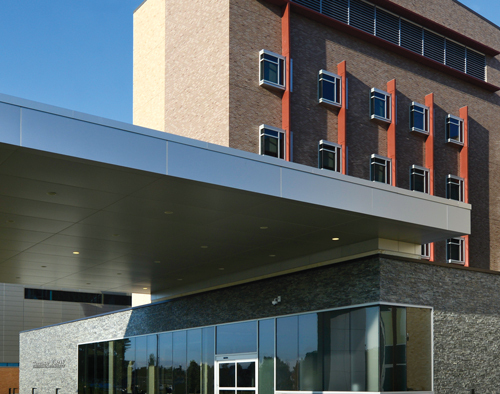 Patients and visitors to Terrace View also have convenient access to the amenities of the ECMC Main Building. Visitor passes must be obtained at the Information Desk in the front of the main lobby on the ground floor. Visitation in most areas of the hospital is limited to two people per patient. Patients and visitors to the Grider Family Health Center also have convenient access to the amenities of the ECMC Main Building. Visitor passes must be obtained at the Information Desk in the front of the main lobby on the ground floor. Visitation in most areas of the hospital is limited to two people per patient. Patients and visitors to the ECMC Family Health Center also have convenient access to the amenities of the ECMC Main Building. Visitor passes must be obtained at the Information Desk in the front of the main lobby on the ground floor. Visitation in most areas of the hospital is limited to two people per patient. Patients and visitors to the Behavioral Health Outpatient Center also have convenient access to the amenities of the ECMC Main Building. Visitor passes must be obtained at the Information Desk in the front of the main lobby on the ground floor. Visitation in most areas of the hospital is limited to two people per patient. The ECMC Mobile Mammography Unit provides comprehensive breast care to women across Western New York from both the ECMC Health Campus and sites around our community. When the Mobile Mammography Unit is providing services on the ECMC Health Campus, it is parked just east of the Barry & Deanna Snyder Dialysis and Medical Office Building. Patients of physicians affiliated with ECMC can purchase their prescriptions at the METCARE Rx Pharmacy, located in the ECMC Main Building. Monday thru Friday: 9 a.m.–6:00 p.m.
At the ECMC Health Campus, clergy and staff are on call 24 hours a day to meet the diverse religious and spiritual needs of the patients we serve. Services and Mass, bible study and special spiritual counseling sessions are available to help patients, their families, and staff dealing with any number of issues including grief, bereavement, marriage, substance abuse, and more. If you have religious or cultural beliefs that impact your care, please notify your floor nurse, physician, or discharge planner. If you desire the services of the chaplain of your faith, contact your floor nurse or the appropriate chaplain listed below at (716) 898-3000 Ext. 3357. Other chaplains are available on call, including Jewish, Jehovah’s Witness, and other denominations. Arrangements for patient attendance at all religious services should be cleared with your nurse. First Fridays of the Month: 11:45 a.m.
All Holy Days: 11:45 a.m.
Tuesdays & Thursdays: 6:00 p.m.
First Sundays of the Month: 2:00 p.m.